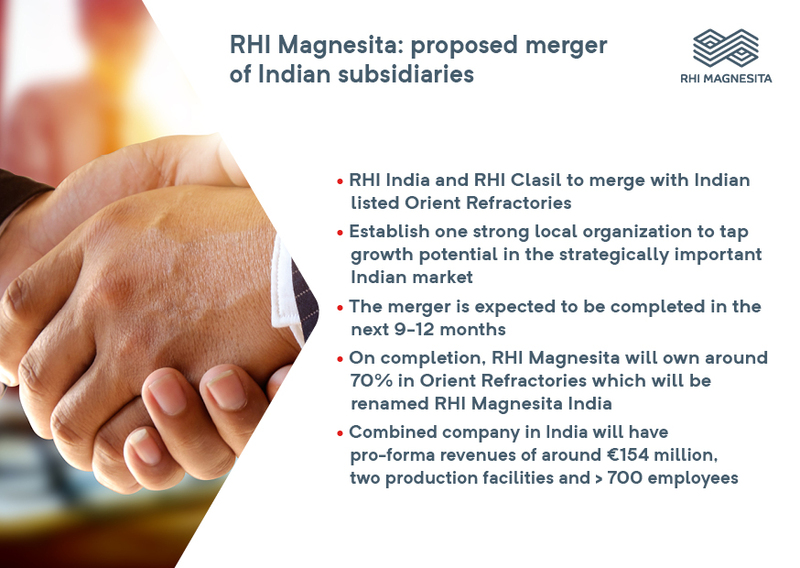 Vienna, August 01, 2018 – RHI Magnesita, the leading global supplier of high-grade refractory products, systems and services, has today announced the proposed merger of its three Indian subsidiaries. The merger is designed to optimally position RHI Magnesita’s operations in the strategically important Indian market to capture growth opportunities more effectively and efficiently. The Boards of Directors of Orient Refractories Limited (“Orient Refractories”), RHI India Private Limited (“RHI India”) and RHI Clasil Private Limited (“RHI Clasil”), at their respective meetings held this Tuesday, approved the proposal to merge RHI India and RHI Clasil with Orient Refractories, pursuant to a composite scheme of amalgamation (the “Scheme”). Orient Refractories is listed on the Mumbai stock exchange. On completion, RHI Magnesita will own approximately 70% in Orient Refractories which will be renamed RHI Magnesita India. The transaction is expected to be completed in the next 9-12 months. Orient Refractories is currently 70% owned by RHI Magnesita and a leading manufacturer and supplier of special refractory products, systems and services for the steel industry. RHI India, a wholly-owned RHI Magnesita subsidiary, is the Indian sales company of RHI Magnesita group offering a full range of refractories and related services sourced from various RHI Magnesita group entities to Indian customers. RHI Clasil, is 53.7% owned by RHI Magnesita, is a manufacturer and supplier of mainly Alumina based refractories for steel and cement. The key objective of the proposed Scheme is to combine the strengths and competencies of all three companies to establish one consolidated listed company that is well positioned to seize future growth opportunities and enhance shareholder value. This merger is part of RHI Magnesita’s strategic pillar “markets” which focuses on building a global presence with strong local organizations and solid market positions. India’s growth prospects in the refractory market derive primarily from the steel sector, which is by far RHI Magnesita’s largest customer industry (74% of 2017 pro-forma revenues). India became the third largest steel producer in the world after a decade of solid growth and an ambitious government program aims to reach 300m tons of steel production by 2030, triple the output of 2016. With one strong and integrated local organization, the industry’s most comprehensive product portfolio and proven supply and sales capabilities RHI Magnesita India will be optimally positioned to leverage the positive local market developments in India. 908 equity shares of Orient Refractories (of face value of Re. 1 each) for every 1,000 equity shares of RHI Clasil (of face value of Rs. 10 each). Post the Scheme, the shareholding of RHI Magnesita, through Dutch US Holding B.V. and other group companies, in the combined company is likely to be around 70%. Furthermore, around 5% of the shareholding will be held by certain individual shareholders of RHI Clasil who are not part of the RHI Magnesita group. The Scheme will be subject to approvals from various relevant regulatory authorities including approvals from the stock exchanges, shareholders and creditors of the respective companies, the National Company Law Tribunal (NCLT) in India and necessary corporate approvals and filings with the registrar of companies and the stock exchanges.